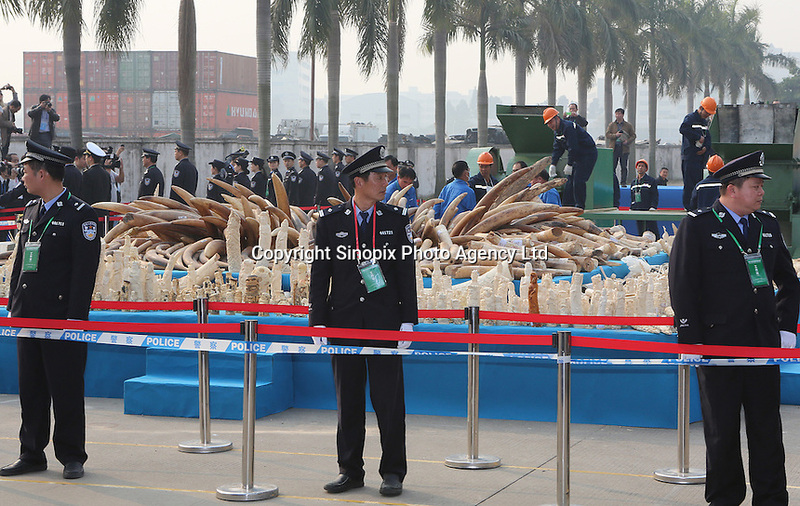 A handout photo from the Hong Kong-based 'AquaMeridian Conservation and Education Foundation' shows China Customs officials stand by 6.2 tonnes of confiscated ivory prior to crushing by Chinese customs under the supervision of China's State Forestry Administration, Huangpu Port, Dongguan, China, 06 January 2014. After the United States, Philippines, Gabon, Kenya and Zambia, China is the latest country to crush its confiscated ivory as a symbolic gesture, sending a message to consumers, traffickers and poachers in Africa and Asia that the ivory trade is wrong and will make Africa's last remaining elephant populations extinct within 15 years. Scientists estimate that 25,000 elephants were illegally killed in 2012.